Japanese Episode 048: "Gardie and Kojirou"
American Episode 146: "Holy Matrimony!" Satoshi and his friends are walking down a road one day when they come across a missing person poster featuring a boy who looks a lot like Kojirou! Suddenly, a butler in a limo appears and asks the kids if they know who the young man is. When they say that they do, the butler grabs them and takes them to a nearby mansion. There, the man explains that Kojirou's parents lived in this mansion and that their will says that he will get the mansion only if he gets married within 24 hours of their death. Musashi and Nyarth overhear this and force a reluctant Kojirou to appear in front of the butler to claim his inheritance. Suddenly, laughter begins to echo throughout the mansion as Kojirou's parents burst out of their coffins! Kojirou expresses a lack of surprise at his parents as he's dragged into a room where his fiancé is waiting. Much to everyone's surprise, however, the fiancé, Rumika, looks exactly like Musashi! After the initial shock wears off, the Rocket trio is lead to a gym where Rumika's Rafflesia uses its gas attacks to knock everyone out. 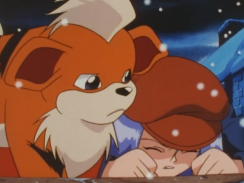 After Musashi and the others are kicked out, they hear scratching on a nearby door and determine that the one responsible is Kojirou's childhood friend, a Gardie named Gar-chan. 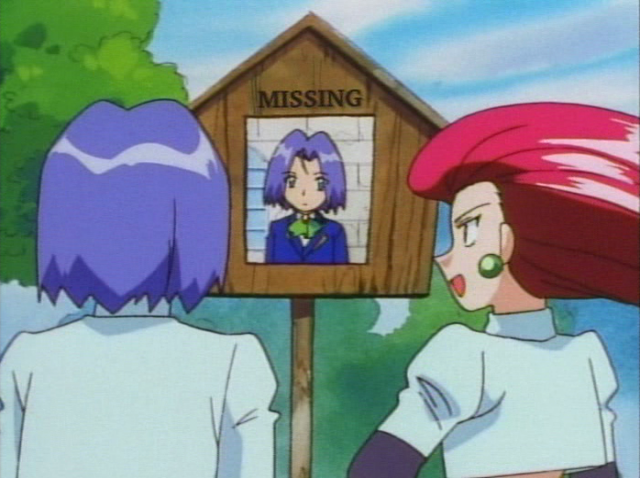 They release the pokemon, who wastes no time in finding Kojirou and saving him from his crazy fiancé. Later, Kojirou tells his pokemon that he has to leave the mansion again in order to live a free life. This is an episode that pretty much every fan of the TV series has seen, knows like the back of his or her hand, and fondly remembers as being one of the best episodes of the franchise. We're introduced to some major character backstory that gives us some insight on why Kojirou is the way he is, all while being introduced to a lovable set of new characters. And even though I do enjoy it quite a bit, I still have a major problem with it; the entire episode was all over the place. I know a lot of people see that as a example of how the Kanto saga's filled with that random fun that makes so many of its episodes so memorable, but I feel like it really hurt this particular episode. It seems like the writers had a number of ideas for scenes they wanted to use but couldn't be bothered to construct the comprehensive narrative necessary to connect these otherwise random scenes. They do a good enough job of things at first, I guess. But once Rumika enters the picture, any sense of coherent storytelling is thrown out the window. What was the point of that scene in the basement / dungeon / vault / whatever, really? 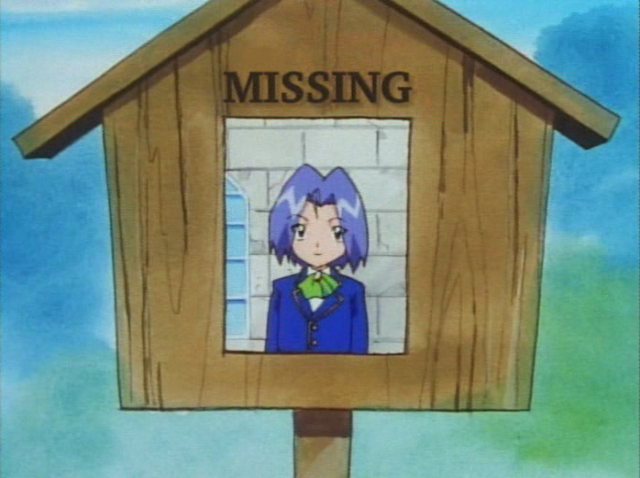 Why did Kojirou have to rely on his Gardie to get him out of his jam instead of, say, his other pokemon? How come absolutely nothing was resolved by the end of this episode? What was the point of Satoshi and his friends hanging around when they pretty much did absolutely nothing to help the conflict? Still, the episode is amusing because of the insane cast of characters. Kojirou's parents faking their own deaths to trick their son into returning is pretty crazy, and the way Rumika speaks in the Japanese version is absolutely hilarious. The dubbed version surprised me because they left in all the references to death. 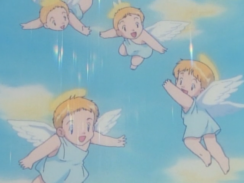 And the angels. And the crosses on the coffins. 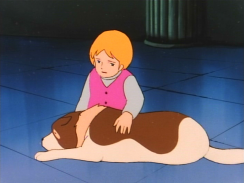 I guess it was unavoidable, really, but it's still hard to imagine 4Kids not editing this episode to shreds had they dubbed it a few seasons later instead. Other than that, we get some new voices that I'm not a fan of at all, but I'll get to them later. 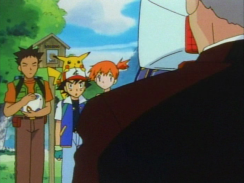 Narrator: "Ash continues his journey with Misty, Brock, Pikachu, and their egg-celent new companion." Can you tell this show was dubbed in the late 1990s? When Satoshi and his friends tell the butler that they know who the boy in the picture is, he shouts out "Thank you, God!" (arigatou, Kami-sama!). In the dub, the butler exclaims "Eureka! Oh, Eureka!" instead. 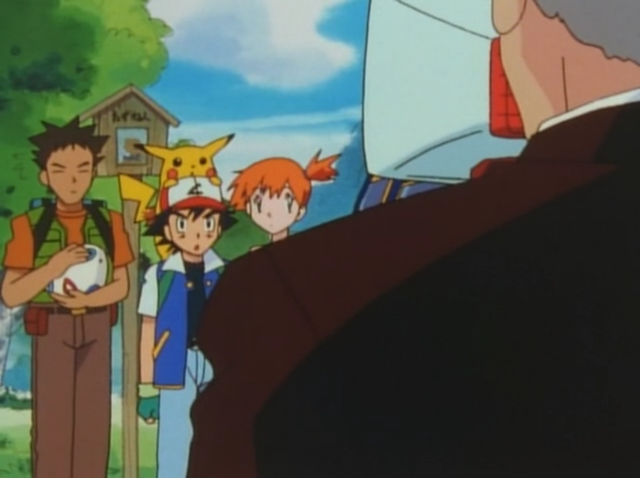 Brock: "I've seen shopping malls smaller than this place." 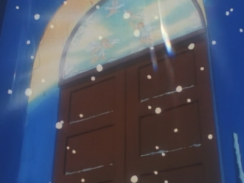 Originally, Takeshi says that the mansion is about a hundred times bigger than his house. While the English version more or less conveys the same meaning ("this house is really big"), the exact wording is a little different. So you know that fake flashback of Kojirou dying that everybody except Kasumi falls for? Well, that whole scene seems to be, more or less, based on the final episode of the 1975 animated series The Dog of Flanders. 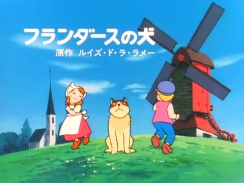 The Dog of Flanders, based on the Belgium novel of the same name, is about a boy named Nello and his dog, Patrasche. 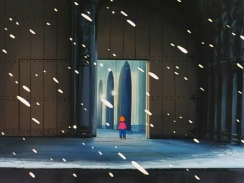 In the final episode of the TV series, the young boy, tired and poor, walks to the cathedral of Antwerp and finds that the door is open. He enters the church, falls down from exhaustion, and looks up to see angels coming for him. In the final scenes of the series, both Nello and Patrasche die and are happily carried off to Heaven. The Pocket Monsters version shares a few similarities with the events here. As you can see from the pictures, Kojirou is wearing, more or less, a palette swap of the same clothes that Nello's wearing. 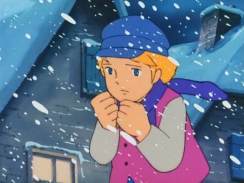 The weather outside is cold and snowy, just like in those final few The Dog of Flanders episodes. Kojirou makes it to a church, just like Nello. And, of course, the angels come and take him away. 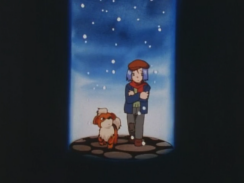 There are some notable differences, of course - Kojirou and Gardie don't actually make it into the church, Gardie survives while Patrasche does not, the angels in Pocket Monsters aren't naked, etc. - but everything else is more or less the same. 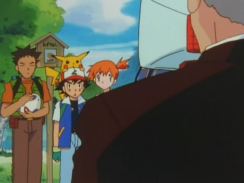 Bulbapedia reckons that the flashback, instead, is a reference to Fyodor Dostoevsky's short story "The Little Orphan." That's also entirely possible, I guess. James: "Farewell. I leave this cruel world for a better place." In the Japanese version, Kojirou tells Gardie that he's going up to God's place now. I think one of the things about this episode that confused fans outside of Japan is what exactly those black outfits that Musashi and Nyarth were wearing. The outfits they're wearing are the same outfits that kuroko (黒子) wear. Kuroko are stagehands in traditional Japanese theater - kabuki, Noh, etc. - and wear black from head to toe in order to avoid drawing attention to themselves. Like stagehands in the West, kuroko are meant to be ignored. 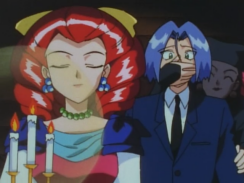 Of course, they're not actually invisible, so the fact that the Kojirou's parents and the butler act like they actually can't see Musashi and Nyarth is the whole joke. There was no way 4Kids was going to call those outfits kuroko and expect any kid in America to actually know what the hell that is, so they called them "invisible costumes" instead. In the Japanese version, Musashi calls Kojirou's parents "maman" and "papan." "Maman" is the French word for "mother" (because, y'know, French = fancy), but "papan" is just gibberish. Guess Musashi needs to brush up on her French, eh? In the English version, Jessie just calls James' parents "Mommy" and "Daddy." The dub also gives the butler a name - "Hopkins." In the Japanese version, he's simply referred to as shitsuji (執事) or "butler." So this episode gives us the English voices for Kojirou's parents, as well as his fiancé. First up, his parents; the father seems to have some half-assed "American trying to sound British" thing going on while the mother seems to be going for the whole "southern belle" thing. Which is kind of funny because their son doesn't have any of that going on when he speaks. He and Misty should really get together someday and trade stories about how weird it is having relatives who don't sound anything like they do. And then there's Jessiebelle, who gets a southern accent as well. Because, y'know...Jessiebelle...southern belle...GET IT? Jessiebelle also loses a number of speech quirks that her Japanese counterpart has. In the Japanese version, Rumika always calls Kojirou "Kojirou-sama" and refers to herself in the third person, while Jessiebelle doesn't do any of this. James: "Don't you fools get it? Jessiebelle tricked you two into coming down here!" 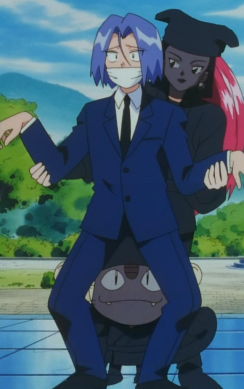 Meowth: "How did she spot us?" Kojirou's line in the original version isn't something that can really be translated into English. He says Rumika wa neko o kabutteru dake nanda, which, when translated literally, is "Rumika is only wearing a cat on her head." "Wearing a cat on one's head" (neko o kabutteru) is an idiom that means that you're hiding your true colors and is roughly equivalent to the English "wolf in sheep's clothing." Later, Kojirou's parents - one with a drum, and another with a flute - do a parody of one of the lines that the main character in Momotarou Zamurai always said. This isn't carried over in the dub because no one would get the reference. Jessiebelle: "I'll follow you to the ends of the earth and the bottom of the sea, James dearest." Originally, Rumika says that she'll follow Kojirou all the way to the depths of Hell. Jessiebelle: "Where are you going, James? I haven't finished teaching you the correct way to eat spaghetti yet." James: "I wanna do things my way, Jessiebelle!" Jessiebelle: "You're not runnin' properly. Let me show you the right way..."
Originally, Rumika tells Kojirou that she's going to bring him up to become an elegant young man. Kojirou responds by saying that he won't marry her, prompting her to tell him not to be so embarrassed. Basically, the whole "you're not ~ properly!" stuff is dub-added. 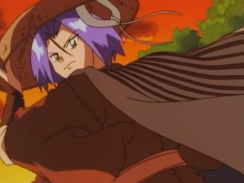 The outfit Kojirou wears at the end of the episode is based on Kogarashi Monjirou, the titular character of an old samurai drama from the 1970s that only older Japanese people would get. A quick Google image search brings up a lot of similar pictures for you to compare. 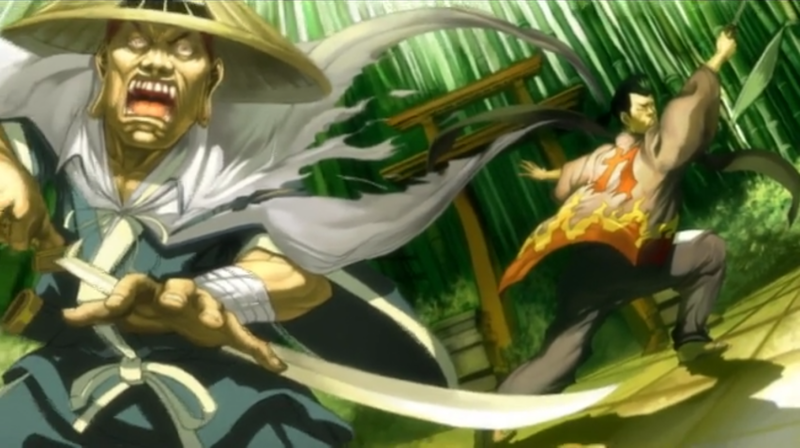 The only other thing I could find about Kogarashi Monjirou, in English, is that a reference was made to it in the Samurai Champloo episode "The Art of Altercation."